A deadly weapon, sometimes dangerous weapon, is an item that can inflict mortal or great bodily harm. By statutory definition, certain items, especially firearms, are designated "deadly weapons per se", meaning they are regarded as deadly weapons no matter how they are used, from the Latin for "by itself". In addition, deadly weapons statutes often contain provisions covering other implements intended to be used to inflict harm. 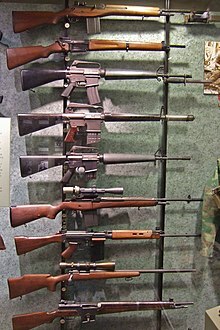 This article is about the weapons used in the Vietnam War, which involved the People's Army of Vietnam (PAVN) or North Vietnamese Army (NVA), National Liberation Front for South Vietnam (NLF) or Viet Cong (VC), and the armed forces of the Army of the Republic of Vietnam (ARVN), United States, Republic of Korea, Philippines, Thailand, and the Australian, New Zealand defence forces, and a variety of irregular troops. 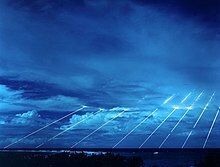 LGM-118A Peacekeeper MIRVs re-entering Earth's atmosphere. An instruction on oleoresin capsicum (pepper spray) at a Marine Corps Base Camp. Non-lethal weapons, also called less-lethal weapons, less-than-lethal weapons, non-deadly weapons, compliance weapons, or pain-inducing weapons are weapons intended to be less likely to kill a living target than conventional weapons such as knives and firearms. It is often understood that unintended or incidental casualties are risked wherever force is applied, but non-lethal weapons try to minimise the risk as much as possible. Non-lethal weapons are used in policing and combat situations to limit the escalation of conflict where employment of lethal force is prohibited or undesirable, where rules of engagement require minimum casualties, or where policy restricts the use of conventional force. Czechoslovakian soldiers with a ZB vz. 26 and a vz. 24. The American Civil War, fought between the Union and Confederate forces, took place from 1861 to 1865. During the war, a variety of weapons were used on both sides. These weapons include edged weapons such as knives and swords, firearms such as, rifled-muskets, breech loaders and repeating weapons, various field guns such as artillery, and new weapons such as the early grenade and machine gun. An anti-ballistic weapon is any weapon (be it a missile, a laser, or another type of object) designed to counter threats which are ballistic objects. Sailors prepare a 25 mm crew-served weapon before a live-fire exercise aboard the amphibious assault ship USS Essex. A crew-served (crew-serve or crew service) weapon is any weapon system that requires a crew of two or more individuals performing the same or separate tasks to run at maximum operational efficiency, as opposed to an individual-service weapon, which only requires one person to run at maximum operational efficiently. The weight and bulk of the system often also necessitates multiple personnel for transportation. A wooden stock AK-47 with a 6H3 bayonet mounted as an ancillary weapon. Even if a soldier's rifle runs out of ammunition, the AK-47 can still be used as a close quarter combat weapon by using its bayonet. 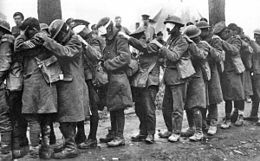 The use of toxic chemicals as weapons dates back thousands of years, but the first large scale use of chemical weapons was during World War I. They were primarily used to demoralize, injure, and kill entrenched defenders, against whom the indiscriminate and generally very slow-moving or static nature of gas clouds would be most effective. The types of weapons employed ranged from disabling chemicals, such as tear gas, to lethal agents like phosgene, chlorine, and mustard gas. This chemical warfare was a major component of the first global war and first total war of the 20th century. The killing capacity of gas was limited, with about ninety thousand fatalities from a total of 1.3 million casualties caused by gas attacks. Gas was unlike most other weapons of the period because it was possible to develop countermeasures, such as gas masks. In the later stages of the war, as the use of gas increased, its overall effectiveness diminished. The widespread use of these agents of chemical warfare, and wartime advances in the composition of high explosives, gave rise to an occasionally expressed view of World War I as "the chemist's war" and also the era where weapons of mass destruction were created. ... that Nazo Dharejo fought off 200 bandits in a gun battle that earned her a reputation as "Pakistan's toughest woman"? ... that whilst carrying out High Explosive Research, British scientists developed atomic weapons? ... that Gonçalo Teixeira Corrêa crossed China in the 1620s to train the Ming army in modern artillery, but lost his life to a mutineer's arrow? ... that the Swarmjet system was a proposed short-range anti-ballistic missile that fired thousands of unguided rockets like a shotgun against incoming nuclear warheads? ... that Liang Jingkui designed an instrument to measure the temperature in nuclear tests? ... that Tube Alloys was the code name of the clandestine British nuclear weapons project during World War II? Do you have a question about Weapons that you can't find the answer to? For editor resources and to collaborate with other editors on improving Wikipedia's Weapons-related articles, see WikiProject Weapons.